Do you recall back in 2008 when John McCain acquiesced to his party and named Sarah Palin his Vice Presidential running mate? Oh, the communication and cognitive horrors which were put upon us all! Palin was a walking advertisement for better education and required (spectacle) viewing for anyone who harbors disdain for reading. Also, check out the coached hand Steepling. I offered Palin was handed to nonverbal in an effort to promote a false reality of confidence. Katie Couric as a highly competent TV journalist (and probably her staff) quickly discerned Palin's was a functional illiterate regarding communications skills. It only took a few weeks of watching and listening for Palin's shortcomings to unfold. Notice, we have avoided any criticism of the former Alaska Governor regarding her diminutive cognitive acuity. We are thankful we were not exposed to Palin on a national level any more than the failed McCain/Palin ticket. Little did we know or suspect what was to come. America conservatives, Russian and GOP internet operatives, and pathetic and gullible non-voters have handed the nation a horror which surpassed the wildest of nightmares regarding Palin. Little did we know of our future. As for reading, writing and "rithmetic: as we learned from Kindergarten through various levels of primary education; some people even move on to higher levels of education. We would never reserve and promulgate intellect and learned skills (ability) as requisite to lead a happy and productive life only for people who finished high school or who went on the college-level education. However, we believe those who studied beyond their Freshman year of high school possess a certain level of communication acumen. I posit we have every right to expect erudite skill levels from the Oval Office. In addition to recent analysis of Trump's Tweets and suggestions he may not write all of his tweets, we have empirical evidence of a total lack of learned skills. Trump offers a communications skills void which would lace Palin's in a crevasse with no bottom. 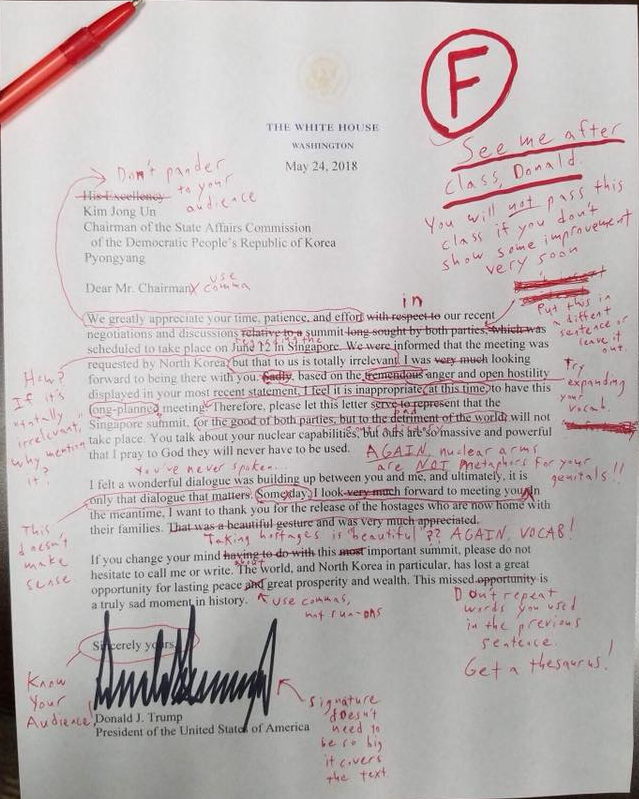 Trump's letter to Kim Jong UN regarding canceling their planned June 12rthmeting, offers analysis opportunities which couldn't be resisted. Occupy Democrats posted a review of the letter and highlighted the extent of its lack of learned skills. We realize the letter was probably hastily crafted based on one-upping from the Trump team. They could not allow Kim to place the final nail in the coffin of a summit Trump should not have accepted without close consultation with people well outside of his close an environment of ever-changing advisers. The letter is, in part, hard to read but we could not locate a more readable copy. We really should have an expectation the US President have a much higher level of written communications resulting from leaned cognitive skills. Or, without question, we should feel the president would employ staff to handle critical communications while cloaking her/his inabilities. We don't have nor can we have such expectation; we elected Trump. And, to think millions voted to have this family live in the Naval Observatory as the Vice Presidential family. Sarah Pain was John McCain's choice to run against Barrack Obama and Joe Biden. There is more linked, here. The Trump Administration has moved to declare it will no longer publish, or make public, the list of visitors to the White House. The supposed "openness" policy started with the Obama Administration and ended after eight years with approximately 6 million names on the list. Of course right leaning surrogates and pundits criticize the Obama Administration based on cases of reacted names, but nonetheless, the names were published. Trump's handlers have offered no reasons for the change in policy. The lack of openness regarding the change fuels suspicion the Trump cabal wants secrecy regarding their interactions. Trump's cabal has total secrecy regarding interactions and meetings when Trump jaunts to his South Florida resort and that very secrecy has lead to revelations. The Koch brothers apparently coddled with Trump at the resort a couple of weeks ago. While the Kochs have previously been reported to golf at the resort (possible members), the recent meeting took place awful close to Trump's authorization the KXL Pipeline. Trump reversed an Obama administration policy. If reports of the pipeline yielding billions via the Koch-owned Canadian Tar Sand fields (reported to be over $80 billion) to the Koch P & L Statements). We are also hearing reports of two past leaders of Colombia also met with the "secrecy-laden" US president. The Sidewalk in front of the White House will be permanently closed to tourists who value the opportunity to pose for pictures in front of America's "House." Close off access to the sidewalk to the public while closing off access to public viewing of who is visiting the Whtie House. Palin? Well, here is the deal with Plain. We are certain hobnobbing with Plain offers Trump an opportunity to fed his ego He can sit and talk with a person who when cognitively compared makes him feel super intelligent. Now take a look at what happens when a president authorizes garbage in the White House. We don't expect any level of class from the Trump administration. We do, however, expect respect for the sanctity of the nation's "House." The image of Clinton is an archived picture based on her past as First Lady. what happens when some on the Web take the picture and transforms it as such? It is important to note the developer of the photoshopped picture removed or made oblique specific bodies parts of the subject. The White House image of Trump's friends isn't going over well for some. CNN contributor and republican pundit, Anna Navarro, spoke about the classless exhibition. But of course, most rational minds wouldn't have allowed the likes of Nugent in the White House and a lesson for all for inviting the nation's number one dimwit: Paln. We really don't expect better from the likes of Palin, Nugent and Kid rock. We feel the direct opposite of managers at the White House. The Obama's have celebrated Christmas in the White House since the end of their first year with Barack Obama as the nation's 44th President. Barack and Michelle Obama have taken part in each Christmas (Holiday) public event during the full eight-year period. As we near the end of their eight years in the white House, it seems Michelle Obama has shied away from certain public celebrations and I for one can not blame her. The FLOTUS continues to receive horrific characterizations from many on the social right despite every effort to show a "high-road" face. Hell, Michelle Obama and her husband have even taken the high-road regarding the recent election even with final results showing Hillary Clinton winning the vote by 2.84 million votes. It should be noted President Obama remains professional and civilly mindful of his role as a lead of what we used to call the free world. The Obama 2016 Christmas (White House) Card is an indication of a family which exudes class, civility, and decency while staying mindful of serving as the First Family to All North-Americans. While the vast majority of people who live in the United States celebrate December 25th ins one fashion or another, it is important to know not all who live in the country celebrate the holidays that of the birth of Christ. In fact, it doesn't take a leap to know some do not believe in any form of religious worship and there are certain segments of the population who are very religious but do not believe in the Jesus Christ biblical figure. All said, the Obama's choice of card celebration is yet another example of their devotion to service to all and goodwill towards all. 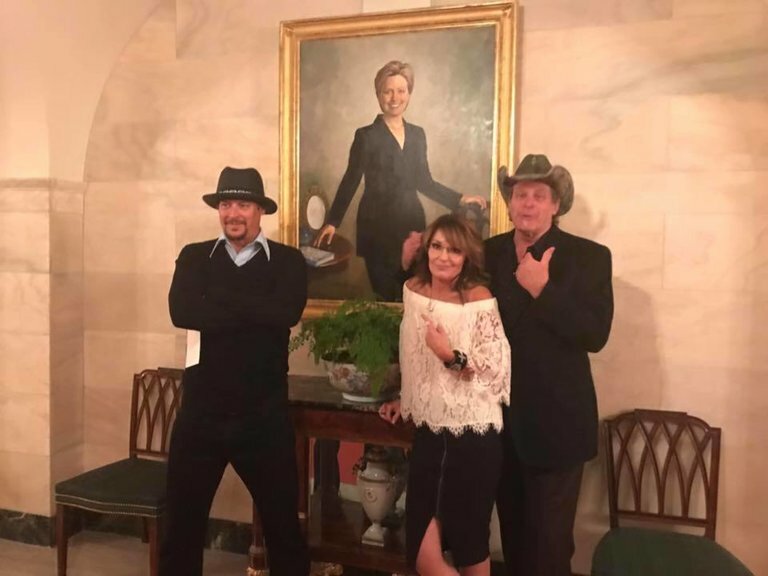 Wouldn't you know conservative America's number two slim-bag, Sarah Palin, took exception to classy family oriented White House card? Imagine a person with Palin's family casting criticism on the Obama's? Imagine that? Imagine a family which is nothing shy of dysfunctional which may have law enforcement records at local police departments, experiencing a jealous and at times appearing intoxicated matriarch levying comments as that which follows. The US Presidency is guided by the US Constitution which clear states a separation of Church and State. While Republicans have chosen to fully incorporate matters of religion in their government model, even the vast majority of Republicans do not dare take exception to the Obama's choice of Holiday Card. Actually, what is the point beyond child-like aggravation? 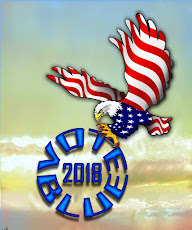 From our friends at VoteVets.org. 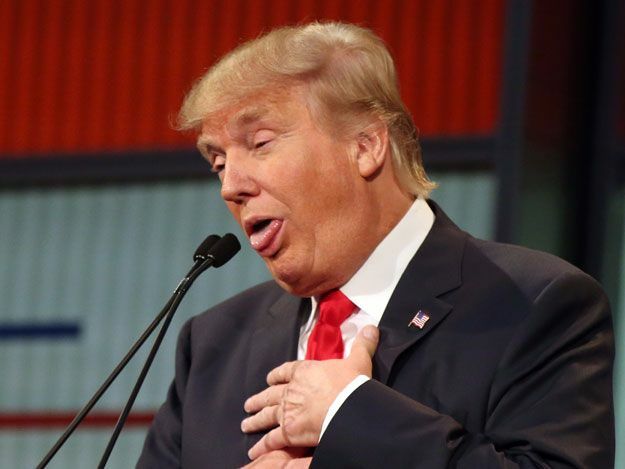 Now that Donald Trump has been ordained the "presumptive" GOP nominee for the 2016 General Elections, it si time for a quick peep (many to come) of Trumpism. We will use embed from Facebook, to remind you of Trump as the showman, the bigot, and the charlatan. Trump "The White Supremacist hero"
An expert view and critical media analysis with Trump misogyny as a backdrop. A conservatives view of their nascent party leader. The insane WWE like-presence of Trump and His henchmen/women and hit people. People can not lower themselves much lower in any gutter. Ted Cruz father in cohoots with Lee Harcv ey Oswald? Mediaite captured the insane essence of Sarah Palin's 20-minute last week. Would you believe someone in GOP Politics paid Palin for what follows? I am not going to re-run the full twenty minutes version. It is posted on another post from today postings. Can you imagine Palin with a standing invitation to the White House? Sarah Palin went on a truly bizarre and rambling 20-minute speech in Milwaukee on Friday. Here are the highlights. Now for a bit of Trump with less attention public insanity, but a heavy dose ofeconomic ridiculousness policy . CNN, Ben Stein and Trumpism uncloaked. "He might as well say he’s gonna flap his wings and fly." And that was yet another episode of "Your GOP."